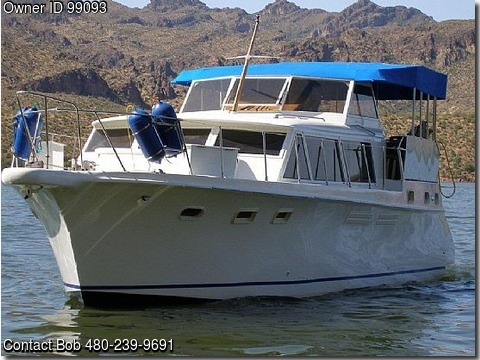 Boat is located in Mesa,Arizona.Please contact the owner @ 480-239-9691 or bob@royalaviation.com…Entry to the salon is from the covered aft deck and down steps,Proceeding forward through the salon and down steps, the galley is to starboard with the guest head opposite to port,The guest stateroom is in the bow. The master stateroom with private head is down steps aft from the salon,The interior is teak with light grey carpeting. The aft deck features a Sunbrella top. SALON: Aft to port in the salon, the two L-shaped lounge areas are conveniently located for galley access as well as salon conversation. The salon features blue gray and maroon with Yachting accents sofa The Blue grey sofa is convertible to a double bed and has storage underneath This yacht is equipped with fire extinguishers. MASTER: Two twin berths with bedspread, shams, pillows and teak highlight this stateroom which is complete with electric flush head plus stall shower,Air conditioner controls are also included. VIP: The guest stateroom features two single berths to port and starboard with sitting bench in between A hanging locker, dresser storage, overhead hatch, and two port lights The guest head is equipped with electric Flush head, shower with side light, and mirrored medicine cabinet with tremendous storage. ELECTRONICS: The flybridge electronics are impressive: Northstar GPS Chart , depth sounder, and Fishfinder with a four display capability. Wet compass, All new electronic engine display. DECK AND HULL: This yacht features the new style sport deck integrated swim platform cockpit with transom door. The wide swim platform features comfortable space for several swimmers. The cockpit houses , dockside water hookup, flagpole, cockpit carpet, boarding steps. Propellers reconditioned January, 2005, as well as application of new bottom paint and hull paint. Partial equipment list includes: Cruise Air A/C, Battery charger, electric windlass, anchor with chain, Morse engine controls, holding tank, Racor fuel filters. The yacht power has been upgraded with the addition of two new Yanmar Turbo 440 HP Diesel Engines at a cost of nearly $100,000.00. REMARKS: “Kaley K” is a fine, example of this popular Hatteras Motor Yacht She has been continually maintained and upgraded by a knowledgeable yacht owner. Her yearly service has just been completed. This Classic Hatteras Yacht is now offered below appraisal at $220,000.00…REDUCED, CHECK it OUT..